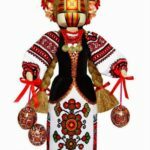 Why does the Slavic folk doll have no face? 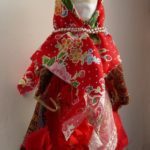 Indeed, the traditional rag doll is faceless. As a rule, not indicated, the face remained white. Meanwhile, a faceless doll, as an inanimate object was inaccessible to the evil, unkind forces to get into it, and therefore harmless to the child. In addition, it had to bring him well-being, health, and joy. 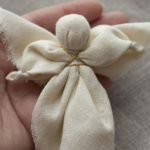 It was a true miracle: from several rags, without additional details – hands and legs, without a designated face, the master managed to produce the character of the doll. The doll was emotional, it could laugh and cry. 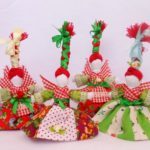 In fact, in ancient times, the dolls had another purpose, it protected from disease, misfortune, and evil spirits. The doll took care of a man, and was called: guardian or bereguinya. 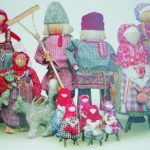 As a rule, the most protective were dolls, made without needles and scissors. 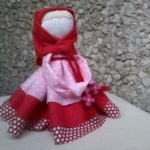 Also, creating a doll, a master avoided cutting the fabric, instead, he/she used to tear it. 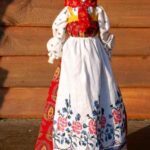 That’s why such doll sometimes was called “rvanka” (from the Russian word “rvat'” – to tear). Even before the birth of the child, they made a doll and put it in a cradle so that the doll “warmed” it for the future baby. And when the baby was born, the doll stayed with him. In order the baby to sleep soundly and quietly, his mother would say: “Sleepy-insomnia, do not play with my baby, but play with this doll.” The doll distracted the evil spirits, protecting the baby. 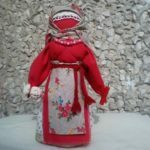 A rag doll-bereguinya made by hands, the mother gave her daughter before the wedding, blessing her for marriage. And she gave it to her adult son, who went to the army, and to her husband – on the road. 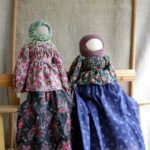 Of course, there were a lot of dolls in the peasant families, treasured, they protected everyone. 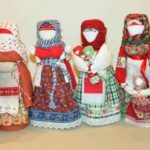 The peasants believed that the more dolls, the more happiness in the family. 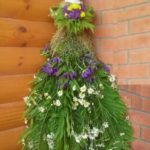 So that the air in the house was clean, produced useful herb doll. 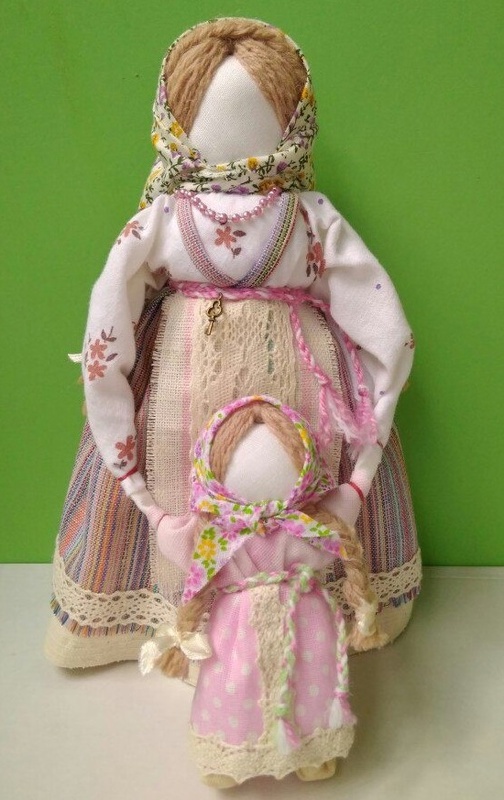 Hung in the air over the cradle of the child, this doll filled with scented medicinal grass, spread a herbal spirit. It drove away the spirits of disease. After 2 years, they changed the grass in the doll. That’s what our ancestors did. 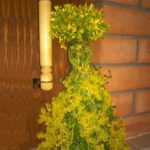 Kubyshka-Travnitsa prevented the disease from penetrating into the house. Besides, it gave off warmth, as from a caring hostess. Also, a protector from evil spirits of illness, and good comfort maker. 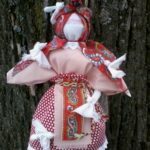 Doll “Krupenichka” (other names “Zernushka”, “Goroshinka”) – this is an amulet for satiety and prosperity in the family (for household). 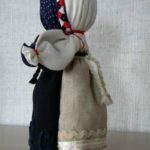 Traditionally, this doll, filled with buckwheat, wheat or peas, was the main doll in the family. The first handfuls of grain were taken from a sack sewn in the shape of this pupa. The grain in it symbolized the saved forces of the Nursing Earth. After the harvest, the doll was again filled with the selected grain of a new crop. Dressed up and carefully stored in a conspicuous place in a red corner it was a family treasure. They believed that only then the next year will be full and there will be prosperity in the family. In a hungry time they took cereals from a chrysalis and cooked porridge from it. According to belief, this porridge transmits the forces of the Mother Earth. Entering the hut, the guest could guess by the doll whether the family was full. 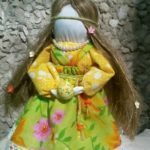 If the chrysalis was thin, then the family is in trouble … And today this doll will help you to have prosperity in the house. 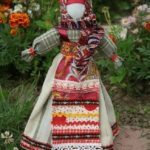 Desyatyruchka (ten-arm doll) – a doll designed for a young woman (a girl who recently married). Often given to the bride for the wedding, it meant she could do everything, and everything went well with it in the family. 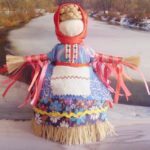 Traditionally, made from grass and straw and beautifully decorated, this doll decorated a prominent place in the room where the woman spent time in work. Then the doll was burned. Undoubtedly, an important moment in a person’s life is a wedding. 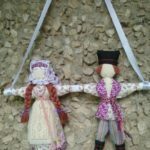 In this case, there was a special ritual doll “The Couple” (sometimes called “Nerazluchniki, which means “Inseparable”). In the female and male figures, the common hand is a symbol of a strong marriage union. Made of three red flaps of the same size, the wedding “couple”, fixed on a towel, was a gift to the young at the wedding. 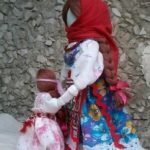 When the couple had their first child, they started using a towel, and gave the doll to the child or kept all their life as a guardian of the family and marriage. “Tolstushka-Kostromushka” (Woman’s essence) is a guard against loneliness. Its task was to restore fertility to a woman, to lure the soul of a child. 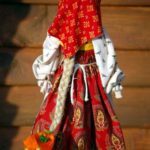 If within a year after the marriage a woman did not become pregnant, they made a doll and put it on a prominent place on the side of the doors. Besides, any female relative made it: a sister, a godmother, a mother or a grandmother. When a child appeared in the house, the relatives carried away the doll and hid it in the house. Tolstushka-Kostromushka carried the image of a girl, which combined several ages simultaneously: 8-9 years old – a nurse girl, 10-12 years old – a teenage girl. From the nurse girl – doll’s chubby cheeks, and a figure, and from a teenager – forming breasts. On the one hand, she knows how to behave, on the other, she can be an adviser to her younger sisters and brothers. It seems to be saying: “Everything is fine with me, I just do not have enough brother or sister!”. 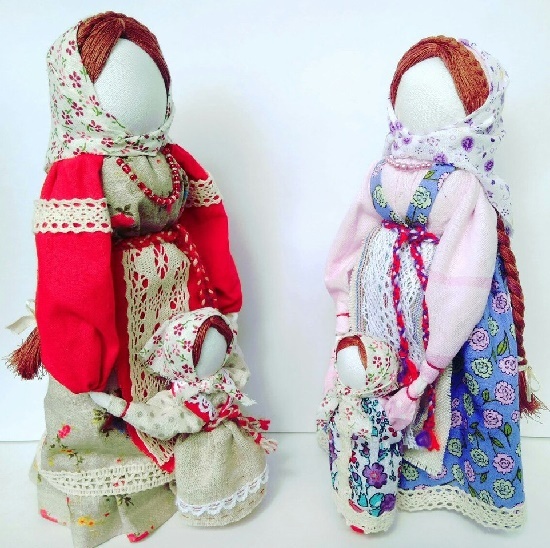 In many Russian fairy tales there are dolls, to which heroes trust their sorrows and joys, and share their thoughts. Besides, the small dolls-assistants do not leave their owners in trouble. A horse is a friend and companion of man in life. It is the conductor of human souls in this world. In ancient times, a lot of people’s lives depended on the horse. Without this animal they could not do, no sowing, no trip, and no wedding. Everywhere a faithful horse accompanied him. Since that time, the preserved expression “to be on horseback” means success and luck. The Sunhorse at home brought happiness and luck. 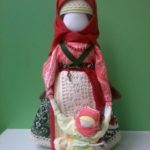 Doll Paraskeva – the mother of women’s handicrafts. Saint Paraskeva is the Christian patroness of women and women’s labor. In November there is a holiday – the day of Paraskeva Friday. St. Paraskeva Friday in Russia was revered as a woman’s patroness, and the patroness of needlewomen. 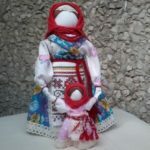 The doll “Zhelannitsa” (wish doll). Every girl in the village had such a girl-doll. Not shown to anyone, if a girl wanted the wish to come true, she sew a bead as a gift on a doll’s dress or tied a ribbon, saying: “Look, what a beauty you are!” And for my gift, let my wish come true. The holiday of Spiridon is a holiday of the winter and summer solstice, a holiday of the emerging or departing sun. 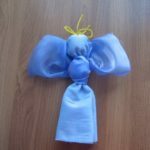 It passed with participation of this doll in the rituals. At the festival there were rituals dedicated to the sun. They rolled the wheel off the mountain and burned it along with other symbols of the sun, saying: “Wheel, burn, roll, with the red spring come back!”. At the end of the holiday thee burned the doll without clothes, and clothes were for the next doll. In addition, people burned all old, having a round shape, as if the doll had to take everything old and worthless from people and free up the forces for a new life. Spiridon by turning the wheel can completely change your life by directing it in the right direction. 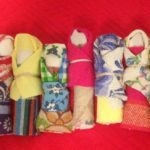 With the onset of spring the girls did and gave each other bright dolls with hair of unusual colors. These dolls “Freckles” had the power of preserving youth. 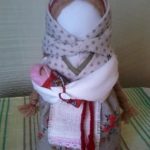 The doll is a multicomponent composition: a lot of children tied to the body of the main doll-mother by a belt. Actually, a large number of children lead to the prosperity of the family. So, it means that in a house where there are many workers there will always be prosperity. 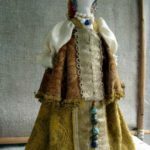 It, unlike most ceremonial dolls, was never burned, but kept in a house somewhere higher – on a cupboard, on a shelf, without letting anyone else in the hands. 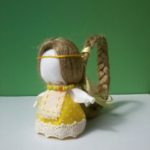 According to folk beliefs, such a doll helps to realize the desire to have a healthy child, and also affects the relationship between already existing children and parents. “World Tree” embodies the unity of the whole world. This is a kind of model of the universe and man, where every creature, object or phenomenon has its place. In the horizontal plane, the world tree and the space around it, divided into four parts, express the idea of ​​time. In particular, morning, day, evening, night, spring, summer, autumn, winter and space (east, south, west, north). Vertically, the tree divided into three parts means: the lower one – the root (the underground world), the middle one – the trunk (terrestrial world) and the upper one – the crown (the heavenly world). To each of these parts belong certain creatures. Below, near the root, live snakes, frogs, fish, waterfowl and animals, because the bottom of the tree symbolizes not only the underworld, but also water. In the middle part, on the ground, there are large animals: tours, deer, horses, bears, and wolves. This is also the world of people. At the top of the world tree settle birds and bees, and here are heavenly bodies. The world tree is also a clan tree. 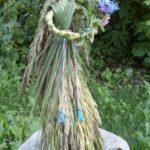 That’s why the wedding doll “World Tree” done on a twig with two forks: at one fork, the bridegroom, on the other – the bride. 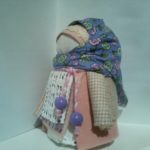 Veduchka – a doll with an image of a woman with a child who recently started walking. She supports him, teaches him, leads him, brings him to life … The special feature of Veduchka – the hands of the mother and the child – is one.